In a demonstration of their offensive prowess and tenacious defense, Mozambique started the game on a 14-0 run and denied Malawi their first basket until there was 4:59 left in the first quarter. The Mozambican team connected on 3 three pointers early on and kept the fans on the edge of their seats with some thunderous dunks. Their blueprint for success was simple: play ferocious, in your face, smelling your breath kind of defense to ignite the transition game. And if the quick basket was not there, they exhibited fluid ball movement, looking for the shot they wanted, which more often than not was a three pointer in the corner. H Chisamanga (7) from Malawi tried to spark his team with two drives to the basket in the dying minutes of the first quarter. 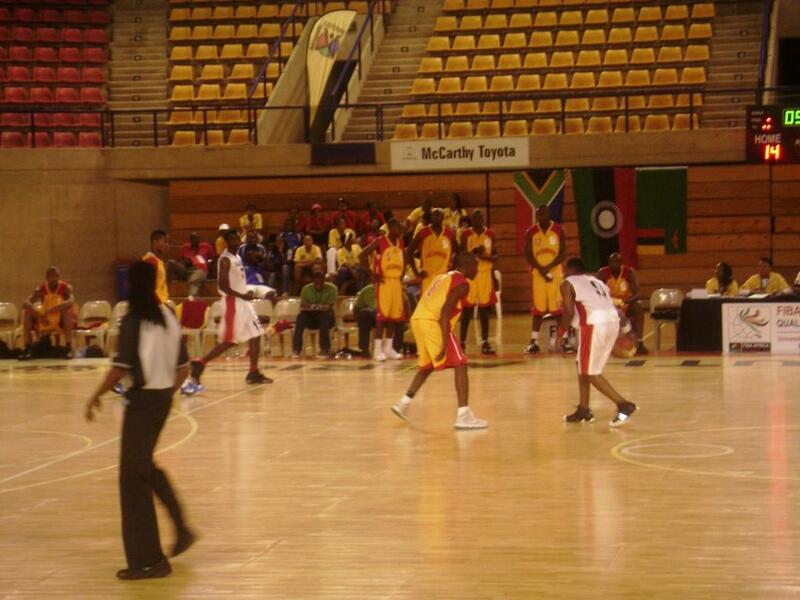 The first quarter ended with Mozambique comfortably leading 27-8. Play resumed in the second quarter and Mozambique continued from where they left, only this time they were attempting to take advantage of back door cuts. Their athletic, long limbed defenders continued to cause trouble for Malawi, forcing shot clock violations and forcing them to take bad shots. The Malawian coach called a time out 2:50 into the second quarter. They came out of the timeout having adjusted their defense to double team the ball at the top of the key, so they could force it out of the point guard’s hands. Mozambique however, had many weapons on offense, whether it was their 3 point shooters, who connected on 10 of their 27 attempts from downtown, or their hustling, versatile post players who vacuumed rebounds and took care of their defensive board. And on occasion, their athletic wings got into the lane and finished above the rim. Mozambique matched their point total from the first quarter, and the teams headed to the locker rooms at halftime with Malawi down 20-54. It was a blowout in the making. In the third, Malawi continued to miss defensive assignments and Mozambique connected on many back door plays. However, H Chisamanga (7), of Malawi had other plans and continued the hot shooting from the first half and shot a three pointer at the 8:52 mark. This would be the last time he’d score in the game as the Mozambican defense adjusted to him. However, J Kunyenda (15) tried to carry the Malawian team on his back and connected on 3 of his 11 attempts from beyond the arc. But Mozambique continued to dominate the game, and would not allow their opponents to go on a run. They provided fans a tonne of highlights, with 8 dunks, 4 of them being in traffic, and one in particular being a backhand “get in my poster” dunk on an unsuspecting Malawian big man. Malawi only made 7 assists in the game while Mozambique dished the rock 28 times. In fact, D Canivete (6), Mozambique had 6 assists, just one less than the entire Malawian team. The Mozambican team continued their drubbing of the Malawian team in the fourth and were now trying to give the fans something to make them jump out of their seats. They even attempted an alley-oop off an inbounds pass from the sideline, but couldn’t connect on the play. F Mandlate (7), led Mozambique with 22 points (including 4 out of 5 three pointers), 4 assists and 6 rebounds. D Canivete (6) had a double-double with 11 points, 10 rebounds, and 6 assists, while A Motos (14), had 20 points for the winning side. H Chisamanga (7) and J Kunyenda (15) had 10 points each for Malawi. In the end, Mozambique surgically picked Malawi apart and won the game easily. Final score, Mozambique 114, Malawi 47.